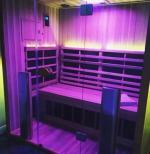 I have just started using an infra-red sauna at my gym and I absolutely love it. I leave the gym feeling like a million bucks everytime. I had no idea they could be so good! I totally recommend them. Excellent for hangovers too!! !